Bill Cosby is pictured leaving the Montgomery County Courthouse in Norristown, Pa., March 29, 2018. Jury selection is scheduled to begin April 2 as Cosby, 80, faces charges that he drugged and molested former Temple University athletics administrator Andrea Constand at his home in 2004. The judge in Bill Cosby's retrial rejected demands Thursday from the comedian's attorneys to step aside during a hearing in which they made clear they plan to attack his accuser as a greedy liar who falsely accused the comedian of sexually assaulting her to collect a payoff. Judge Steven O'Neill shot down what amounted to a last-ditch effort to postpone the trial by attorneys who lost their bid to overturn his ruling allowing up to five additional accusers to testify against Cosby. Lawyers argued he should remove himself because his wife is a social worker and advocate for assault victims, pointing to a $100 donation made in her name to an organization that gave money to a group planning a protest outside the retrial. O'Neill said that was made 13 months ago by the department where his wife works at the University of Pennsylvania and that he's "not biased or prejudiced" by her work. Jury selection is scheduled to begin Monday as the 80-year-old Cosby faces charges that he drugged and molested former Temple University athletics administrator Andrea Constand at his home in 2004. While they sparred with the judge in court Thursday, Cosby's attorneys are also counting on him to make critical rulings to bolster their defense that Constand is a money-grubbing liar. They want O'Neill to let them call Marguerite Jackson, a woman who says Constand spoke of framing a celebrity before she went to police with allegations that Cosby drugged and molested her in 2004. They also want to let jurors know how much Cosby paid her in a 2006 civil settlement. "Those are the bookends: I have a motive and I have a payoff," attorney Kathleen Bliss argued. "The jury should be allowed to view the full context of that." Assistant District Attorney Kristen Fedden said that they doubted the discussion with Jackson happened. O'Neill blocked Jackson from testifying at the first trial because he said her testimony would be hearsay. Prosecutors want him to do the same for the retrial. Prosecutors say the theory that Constand wanted to set up Cosby is undermined by the comedian's testimony in a 2005 deposition that she only visited his home when invited and that he gave her pills without her asking for them. Bill Cosby departs after a pretrial hearing in his sexual assault case, March 29, 2018, at the Montgomery County Courthouse in Norristown, Pa. Prosecutors also argued the settlement is irrelevant to the criminal case, but that if it is allowed in, jurors should also hear about negotiations that led to the settlement. 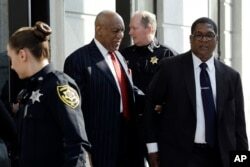 Assistant District Attorney Stewart Ryan contended that Cosby's negotiators initially asked that he be released from any criminal liability and tried to bar Constand from cooperating with law enforcement. He said that amounted to obstruction of justice. "Those things are inconsistent with a person who believes he's innocent," Ryan said. Thursday's hearing started with arguments over the judge's wife, Deborah O'Neill, a psychotherapist who coordinates a team that cares and advocates for student sexual assault victims. O'Neill said that the donation cited by Cosby's lawyers didn't involve her money or their joint assets. "How are my wife's independent views of an independent woman connected to me?" O'Neill said. "She's an independent woman and has the right to be involved in anything that she believes in." O'Neill said Thursday that Cosby's former attorneys raised the prospect of having him step aside in December 2016, but never followed through. He added that he could have rejected the recusal request simply because Cosby's attorneys waited too long to ask. He said they were aware of Deborah O'Neill's work as far back as December 2016, but that they waited until getting several adverse rulings just before retrial to raise it as an issue. O'Neill spoke glowingly about his wife and said it was difficult to have her accomplishments "trivialized" in a legal motion. He said Cosby's attorneys had presented an antiquated view of marriage in which spouses must agree on everything. Cosby's attorneys could still appeal O'Neill's decision to allow the other accusers to testify to the state's Supreme Court. The pretrial hearing will continue Friday, including for arguments over whether jurors can hear about a 2005 phone call in which Constand says she told her mother about the alleged assault for the first time. O'Neill agreed Thursday that the trial wouldn't start until at least April 9 and that the jury chosen from suburban Montgomery County would be sequestered in a local hotel.